Now that Halloween is over, I can officially focus on Christmas! It's kind of a personal policy--no Halloween till after my birthday, no Christmas till after Halloween. Everything gets celebrated that way! But now? We're all set for Christmas! 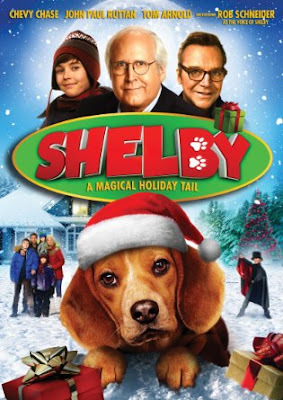 This year, we're starting our Christmas movie watching already, including Shelby: A Magical Holiday Tale. We love a good dog movie! Christmas is coming, and notorious stray pup/escape artist Shelby (voiced by Rob Schneider) is once again locked up in the dog pound. But when a spoiled rich kid tries to adopt him for all the wrong reasons, Shelby runs away and hides in the suburban basement of 10-year-old aspiring magician Jake Parker (John Paul Ruttan). Now with the frazzled local dogcatcher (Tom Arnold) hot on their tail, can Jake, his siblings and their visiting grandpa (Chevy Chase) – who knows a thing or two about messy vacations – pull off the ultimate magic trick and rescue Shelby, making him a part of the family forever? Shelby: A Magical Holiday Tale is a Dove®-family-approved movie for all ages. It's available on Digital HD Oct. 23 and on DVD and On Demand Nov. 3 from Anchor Bay Entertainment. Disclosure: We received a copy of Shelby: A Magical Holiday Tale in exchange for sharing this information. We also really like movies with dogs!